Why do I need bone augmentation? When we lose natural teeth, the bone around the tooth shrinks and this may require bone augmentation. If you have lost a tooth due to gum disease, the bone around the root will have resorbed over time and this will ultimately have been the cause of the tooth loss. If a tooth has been extracted by your dentist, the bone around the root will also shrink. This process occurs in differing amounts between individuals but it does always occur. If you are considering having dental implants it is important to take into consideration that bone does shrink following tooth loss and this may have a serious impact on the success of the implant. Even though there may be sufficient bone for the implant to be placed, the appearance of the crown may not be perfect due to bone loss following tooth extraction. Your implant dentist should be able to identify this during the initial consultation. It may be that the tooth which was lost is further back in your mouth and out of site. 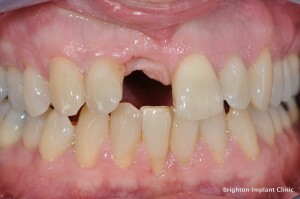 If this is the case then it may be ok to NOT graft an extraction site following an extraction. Provided there is enough bone to place the implant it will be suitable to do this. However in the front of the mouth especially in the upper jaw it may be a good idea to add bone or graft the site where an implant is to be placed. By grafting the site with artificial bone one may reduce the amount of gum and bone shrinkage which occurs following tooth extraction. The bone used for grafting can be obtained from your own mouth, however it is common practice now to use bone derived from another source. The most common type of bone used is bone derived from an animal source. This is usually Bovine bone. The bone is prepared in special laboratories and specifically prepared for bone grafting procedures. The artificial bone acts like a scaffold for new bone to grow onto and this way encourages new bone to form. The artificial bone usually takes 6-9 months to form into hard bone. During this time it is important that there is no movement on the bone grafted site. Dentures can cause problems to these areas if they are allowed to put pressure on bone grafted areas. It is highly recommended that no contact or movement be allowed on bone grafted sites. 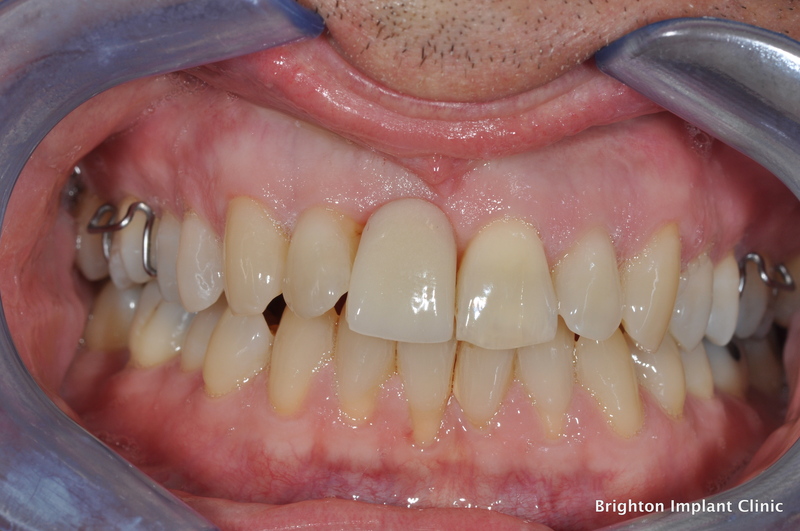 In this example it is evident that there has been some bone loss after the patient lost the upper anterior tooth. After the tooth was removed the area was not grafted with artificial bone and for that reason it is clear that the gum and bone have collapsed. 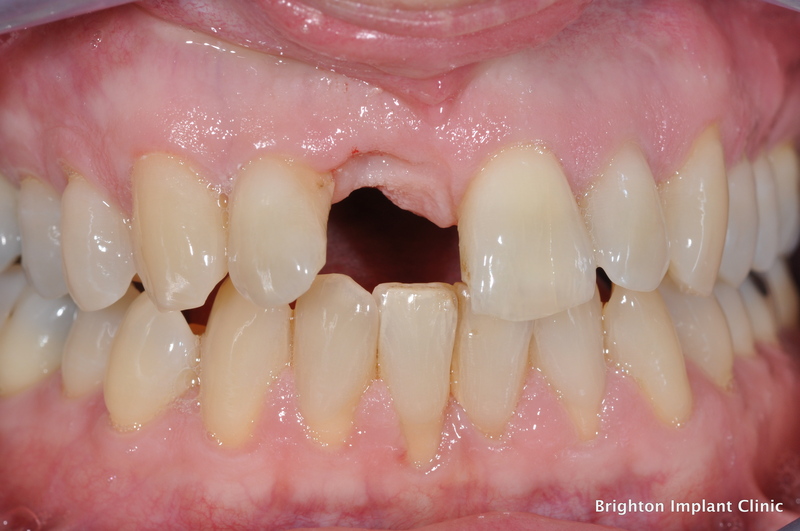 At present the patient is wearing a denture and this is covering the defect which has formed following bone loss. Once the implant is completed with the crown the bone loss will become more evident and the patient may not like the final result. It is very important to address this issue during the treatment planning stages. Bone augmentation is not recommended for every single extraction case however it is strongly recommended when teeth are lost on the upper anterior regions. The patient needs to be made aware of the added complexity of the treatment and the higher risk of failure. If you have any questions or queries regarding bone augmentation procedures please feel free to Contact Brighton Implant Clinic or Call us on 0800 111 6623.